North and South Korea’s leaders huddled for a surprise summit Saturday to try to salvage the planned June 12 negotiations between Kim Jong Un and President Trump. The unannounced meeting, the latest twist in the high-stakes drama surrounding the talks, came just hours after Trump tweeted that his on-again, off-again summit with the North Korean dictator might go forward, after all. On Thursday, he abruptly cancelled the meeting. 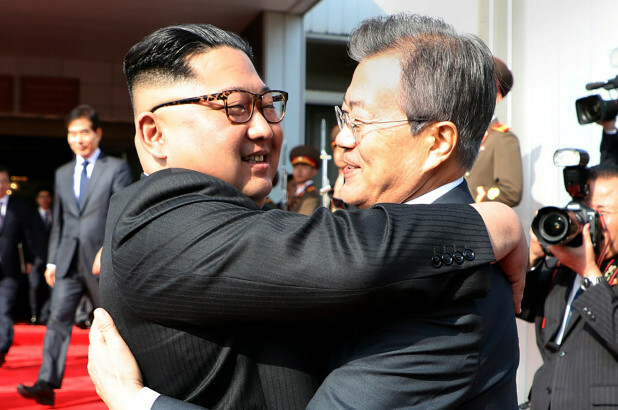 But on Saturday, South Korean President Moon Jae-in crossed the border and met Kim on the North Korean side of the village of Panmunjom, where they talked for two hours about “making the North Korea-U.S. summit a successful one,” according to Moon’s spokesman. The confab in the Demilitarized Zone came just a month after the two held the first inter-Korean summit in more than a decade, where they pledged to denuclearize the Korean peninsula. Trump roiled plans for the June 12 US-North Korea meeting Thursday with a letter that decried Kim’s “tremendous anger and open hostility.” The North had issued a vicious official statement labeling Vice President Mike Pence a “political dummy,” and US officials said Kim’s negotiators had blown off a planning meeting in the previous days.